Kinetic Models has been producing some interesting subjects to date and this latest release is no exception. 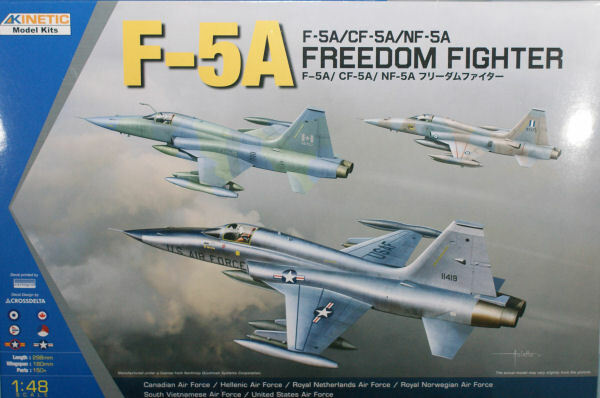 Here is the Northrop F-5A Freedom Fighter in 1/48th scale and if you've been around Cybermodeler for a while, you know the F-5 is a favorite subject here. While the F-5A has had some reasonable kits produced in 1/72 scale, there has been few options in 1/48 and 1/32 scales. In the case of 1/32, the only option I'm aware of is backdating the venerable Hasegawa F-5E kit with the help of the Belcher Bits CF-5A conversion. In 1/48th scale, we only have the Hawk/Testors kit, the slightly underscaled Fujimi kit, and the slightly problematic Classic Airframes kit. Molded in light gray styrene, this kit is presented on seven parts trees plus one tree of clear parts and a small fret of photo-etched parts. Since there are few photo-etched and no resin parts needed to build this kit, the skill level required is really basic. The photo-etched pars included are for the formation (slime) lights and the frames for the chaff/flare launchers. The primary work will be the airframe which is rendered in segments, so some fitting and trimming skills will be needed. The kit is packaged in an end-opening box, which means that you won't be able to stack the kit with much of anything else without crushing the contents. A tray and lid type box would have been a better choice. Kinetic has really captured the detail in the cockpit. One of the most significant structures in there is the twin rails for the ejection seat which also mounts the forward actuators for the canopy lift system. The rear fuselage halves have provisions for one of several panels to be inserted on the sides and a corresponding ventral panel underneath. These options correspond to the blank panels on the sides of the US-produced F-5A that was exported to numerous countries versus the louvered auxiliary intakes for the Canadair-produced CF-5A and NF-5A airframes. These are the same type of auxiliary intakes that would be standard on the subsequent F-5E/F Tiger II. The kit provides these louvered intakes in your choice of open or closed. Of course the F-5 could carry a wider range of stores, but kudos to Kinetic for proving a nice variety to start from in this kit. The decal sheets provide a really nice set of markings printed by Cartograf. The markings provide the key airframe stencils as well as all of the essential national and distinctive unit markings. If this kit goes together as nicely as it looks, we finally have a good kit available of this aircraft in 1/48 scale. With the wide variety of paint schemes that have been carried on this aircraft over the decades, you won't lack for colorful subjects to build and the 16 subjects in this box are a great start. I remember one of the more interesting schemes was worn by the F-5s out of Williams AFB with the black-outlined yellow bands carried on many of their aircraft. The only glitch to be found in the box is the starboard tip tank. The kit actually provides two port tanks. This kit should be available soon at your favorite hobby shop. Better yet, this kit is available at $22.99 from LuckyModel. For a look at this kit built-up, check out our quick-build review here.